WordPress is an amazing CMS(Content Management System) with multiple features in it. In the starting, every blogger tries to learn more about WordPress and its services. To start writing you must add yourself as a user in the WordPress. There are many bloggers who allow other people to write on their blog. For which they add users in WordPress. There maybe the different role of every unique user depending upon the fields you choose for them. You can manage users role in WordPress. But now let me start by showing you how to add new users in WordPress? When we talk about WordPress then people think that it would be hard to do the task. I mean you shouldn’t be afraid of techie things. But let me tell you that there is nothing techie here. You just need to use your WordPress dashboard. There are many options in the left menu of your WordPress. But have you used all of these options? I don’t think so. Most of the time bloggers just focus on writing their blog posts. They don’t interact with WordPress. To add new users in WordPress you just need to follow some easy going steps. I am sure there will not be any difficulty. Step 1:- First thing is to login into your WordPress dashboard. Have a look at all the option shown in the left menu of WordPress. Go for “Users” option and you will find sub-options. “Add New” is the one for which you have to use. Just click on that option. Step 2:- A new page will open in front of you. You will see “Add New User” heading at the top of that page. Many fields will be given to you. You have to fill each and every box carefully. The first field is to enter the username. 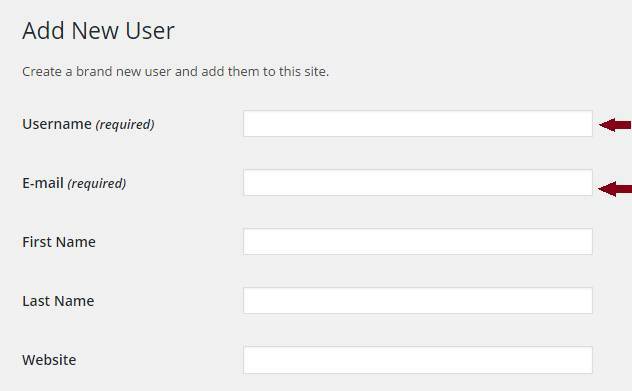 It is mandatory to enter the username because you can’t add new users in WordPress without a username. This username will be provided to the user you are going to add so that he/she can log in later to your website. Now an “E-mail” is required. You can see that WordPress has added (required) with both the fields. For sure e-mail is one of the most important things to fill. If you have registered to any website then you may have noticed that your e-mail or username is required to log in into that website. Here are some optional boxes to fill. The first name, last name, and website fields are optional to fill If you want to add then it’s good, but if you don’t then it wouldn’t be any problem. These options help to manage the users in the WordPress. Here comes the role box to fill. It is always recommended to fill a strong password to increase the safety level. As written below the password field, if you want to change the password then the link will be sent to the user’s mail. You can use password generators to generate a strong password. The point is that you must keep your password strong. The last one is to choose the users’ role. It is dependent upon you. There are different kinds of users depending upon their ability to access your website. The least freedom is provided to the subscriber who can just access the content of the website. The subscribers can’t edit or write the blog post for your website. They just maintain their own profile. The most powerful user role is played by the “Administrator“. He/she can write/edit the blog posts. He/she can manage users role for all. An administrator is the owner of the website. Don’t allocate this position to anyone else other than you. If you have any partner then only you can do it. Step 3:- The final thing is to click “Add New User” and you have successfully added a user to your WordPress. You can add users in WordPress like this as many as you want, depending upon the nature of your website. How to add new users in WordPress? Is it safe to add new users in WordPress? Can I add manage users role? These type of questions are generally asked. But let me tell you that you can add users in WordPress, but the main thing is to provide the role to them. The ability to interact with the content of your website should be provided by you. You have to decide who should be an author, contributor or else? And for sure, you should add new users to increase your website’s strength. New users will explore their new ideas to boost your website. Once again you’re sharing another great tutorial! I use to allow people to sign up as a Subscriber but then stopped it. If people aren’t contributing to your site, what’s the purpose? It gives you that much more “back-end” maintenance and seeing who’s signing up and if they are a “troll” or not. I prefer to keep mine on lock down now. Passing it along! Happy Saturday! It’s the matter of choice whether you want to add people or not. There are many blogs with the editorial staff. Every blog doesn’t have a single owner. I mean they contribute to the same website. Allowing people just to subscribe is a good idea. There is no headache about handling other users. I believe the same. But, you never know the time. Maybe someday you will also allow people to handle your website when you wouldn’t have time. Anything can happen. I appreciate you to come by and take time to comment. Ravi, Very interesting, I always wondered why this feature was available unless you have contributors or authors. Thank you for explaining this one to us. What is the actual purpose of the subscriber though? Do they receive updates when you publish? Adding a new user is upon you. When you allow others to create an account at your website then it’s upon you as how you assign them a role. The role of a user as a subscriber in WordPress is different from the subscriber of the mailing list. This role is allotted to the users just to maintain their profile and they don’t need to fill their details every time they comment at your blog. There is no matter of receiving updates when you publish. This is just the users role. You can set it your own. Thanks so much for this tutorial. I had some kind of idea of how it worked, but now I know exactly how. You made it so easy to follow and I thank you. I like to be the only one to use my blog, but this will come in handy if I ever had to use it. And sometimes life gets in the way and I would need someone to “take over” my blog. So this does come in handy for me for those “just in case” moments. It’s always recommended that you should keep the backup of everything important thing you have. You never know the time. When it comes to create new users then it’s up to you. You have the authority to allow or don’t allow them to use features of your website. For sure you should let your faithful one to handle your website when you don’t get time for that.